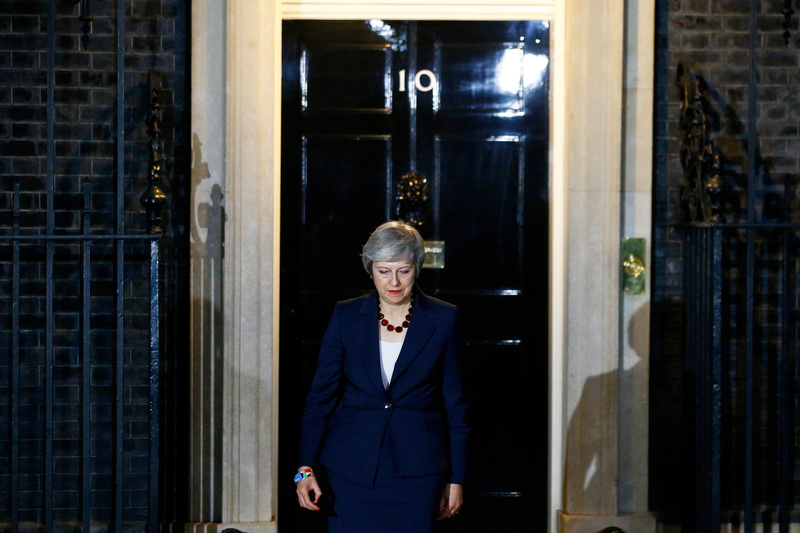 Britain's Prime Minister Theresa May, prepares to make a statement outside 10 Downing Street, in London, Britain November 14, 2018. Two British cabinet ministers resigned on the morning of Nov. 15, thrusting Prime Minister Theresa May’s government into turmoil just two days after she clinched a divorce deal with the European Union. Brexit Secretary Dominic Raab was first to announce his resignation, followed shortly by Work and Pensions Secretary Esther McVey. In his resignation letter, Raab said May’s plan threatened the integrity of the United Kingdom and he could not support an indefinite backstop arrangement where the EU held a veto over Britain’s ability to exit. “Above all, I cannot reconcile the terms of the proposed deal with the promises we made to the country in our manifesto at the last election,” Raab wrote. McVey said May’s deal did not honour the terms of the referendum. European leaders are due to meet on Nov. 25 to endorse the divorce deal. The pound was down 1.6 percent at $1.279 by 1000 GMT on Nov. 15.